Ask any “self-proclaimed” hitting coach what a “short swing” is, and you’ll get many differing interpretations. I think the problem is found in the debate of feel versus real. The challenge is these examples are so vague, they’re widely open to interpretation. And give coaches that kind of slack, and they tend to “hang” their hitters. Some coaches will say his swing is too long, and that ONLY Big Leaguers can have swings like this. This is an EXCUSE. Albert Pujols, Alex Rodriguez, and Mark McGwire have been quoted as saying they swing/swung down on the ball. You see, what elite hitters are feeling, and what we’re actually seeing on slow motion video (what’s real) can be two totally different things. 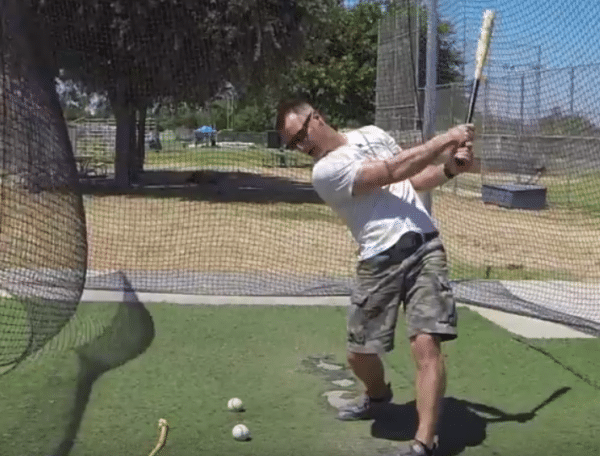 So how do we get our hitters to “swing shorter”, like Kris Bryant…? And using effective external coaching cues, which science says are far superior than internal ones (CLICK HERE to read this post about that). Drill Objective: to help fix “casting”, “long”, or “bat drag” type swings. Ropebat as a supplemental hitting aid. Just wondering. Have you done any studies on the “Swing Rail”? Yeah, I’m totally convinced the SwingRail doesn’t make a hitter “swing down”. Using Batting Weight On-Deck May Dangerous To Bat & Ball Exit Speed? The Rotational Risk Hiding In Your Players’ Swing?